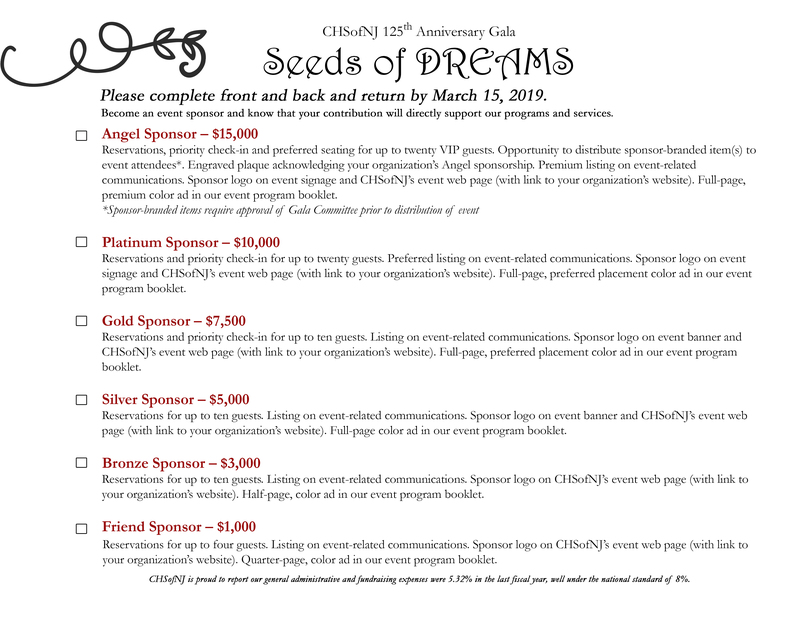 Witness the decades of miracles at The Children’s Home Society of New Jersey on Saturday, April 6, 2019 during our 125th Anniversary Fundraising Gala called “Seeds of Dreams”. Our Honorees for this momentous event will be AvalonBay and Meta A. and William S. Griffith Foundation (In memory of Meta Griffith). The Gala will be held at the Cherry Valley Country Club. The black tie optional event includes a cocktail reception with special performance by Triune Entity and Silent Auction at 6:00 p.m. and dinner at 7:15 p.m. followed by performance by Head Start Special Stars. The entertainment for the evening will be Shorty Long & The Jersey Horns. With more than 200 guests in attendance, this fun and meaningful event will help raise funds to directly support the programs and services CHSofNJ provides each year, touching the lives of 84,000 at-risk infants, children and families of New Jersey and Eastern Pennsylvania. Ticket price, $200.00 per person. Please contact Pamela Cipriano at 609.695.6274 ext. 160 for more information. Click here to donate an auction item. Please follow instruction on the form, thank you. Ad Reservation Form. Please print and send check with art by March 8th (follow instructions) on form. The Children's Home Society of New Jersey is committed to protecting donor information. We do not share or sell any of the information you provide to us to make this donation. I am/we are unable to attend, but would like to send a donation. Enter donation amount here. 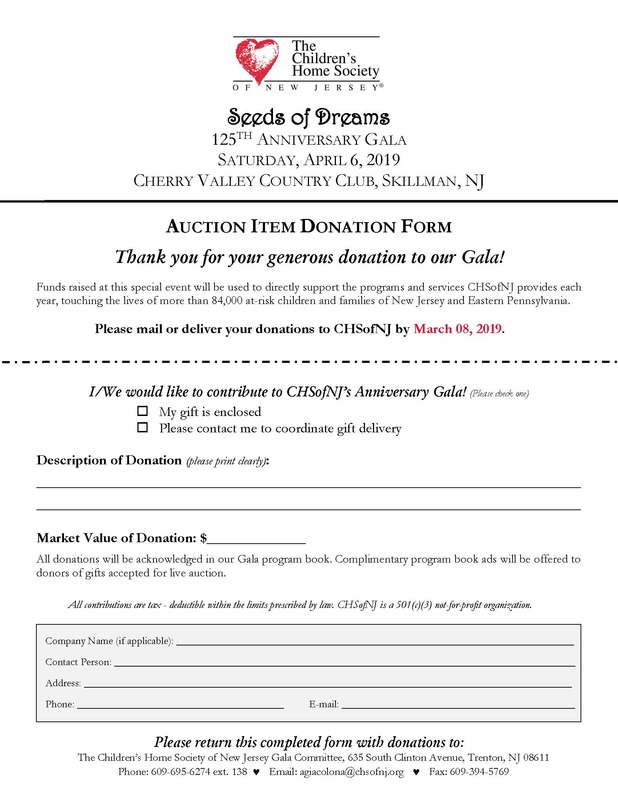 Drawing to be held on April 6, 2019 at CHSofNJ 125th Anniversary Gala at 8:30 PM. Prize money determined by total ticket sales. 50% of ticket sales to benefit CHSofNJ. Must be 18 years of age or older to purchase. No substitutions of offered prizes may be made. Winner is responsible to pay applicable taxes. We will contact you shortly to review the details of your selected sponsorship package such as artwork deadlines (March 15), guest names, and the planned use of your company’s name and logo.